I’ve never been much of a “young adult” reader. In high school I read the necessary books (most of the time), and looked away when half the kids I knew read Harry Potter and the rest read the Left Behind series. Instead, I immersed myself into 80’s movies, NES emulations on my school’s IBM PC’s, and, yes, listened to a lot of Rush. Now that I actually read novels, Ernest Cline has written a book I could really have used ten years ago. Ready Player One takes place about 35 years from now, in a world that spends way too much time in the OASIS, a virtual reality that is half social network, half fantasy land. The OASIS’s benevolent creator, James Halliday, passes away, and decides to will his multi-zillion dollar fortune to whoever solves an elaborate puzzle, spread throughout his vast cyberworld. In this Star Wars meets Willy Wonka chase, the narrator is an orphan teen from Oklahoma City who literally grew up inside the OASIS, while the baddies are part of a faceless corporation that plans to monetize one of the few places where the poor masses can be happy. 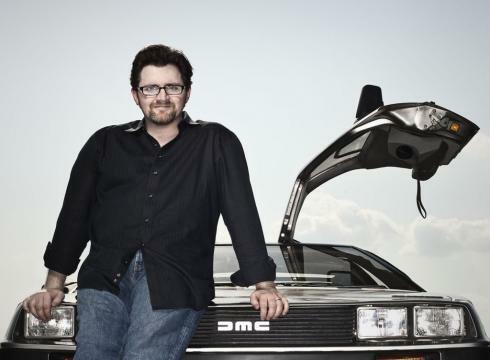 1980’s nostalgia plays a huge part in Ready Player One, and Cline, whose author photograph shows him in front of his own personal DeLorean, knows his stuff. It’s written both with heart and a sense of humor, and many questions you might have while reading this are answered later on in clever, if predictable style. But the predictable elements in Ready Player One actually work, because it plays into the fanboy theme of knowing the canon by heart. Which is not too surprising, as Cline wrote the Star Wars-centric movie Fanboys. This actually reads like a good movie, too. If Warner Bros., who bought the rights to Ready Player One as soon as the novel was sold to Crown Publishing, can pull this off, they will have another classic on their hands. And even if they fail in turning Ready Player One into a great movie, the book in and of itself is a classic in its own right. Ready Player One combines the exuberance of young people on an adventure immersed in an alternate reality set in the bleak future (i.e., Goonies + E.T. + Matrix). I really loved this book and didn't want it to end. I would recommend this book to anyone, but especially the young at heart or those that appreciate an epic quest.